I'm a music lover. One of the things that helped me cope with heartbreak after heartbreak was music. When I am sad or depressed, I listen to music. When I am happy, I tend to not listen so much to music because I'm too busy living life but music is still very much a part of my life. 2018 was a mix of happy and sad though most of it was thankfully happy. Love bloomed for me but my baby PSST died. However, when the PSST door closed, the BeLive window opened. For my music, Spotify was kind enough to create a summary for me which I want to document on my blog and share with you all. Who knows? We may have something similar. The Kdrama feel is still very strong this 2018. Apparently, I still love dancing. 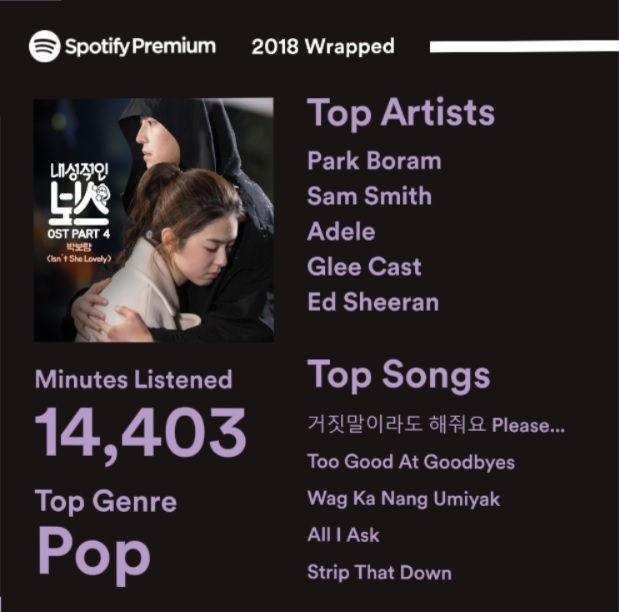 How does your Spotify wrapped look like?